We bet that you’re at the point in the year where if you hear the word Christmas again, you might scream. So we apologise in advance for all upcoming references. We all know that the festive season in hospitality is about two things; getting as many reservations as possible, and organisation. Thankfully, our product team have come up with a couple of gifts that help in both areas. 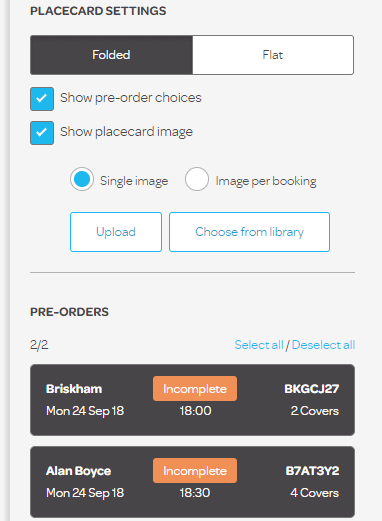 This week we’re launching Pre-Order placecards, and an integrated portal blog to boost bookings. Pre-Orders are all very well and good, but what happens when the customers arrive and Jimmy has no idea whether he ordered the turkey or the beef? The addition of placecards to our Pre-Orders feature solves this issue. Generate them for single reservations, or for pre-orders over a specific date range, and print them out in either business card or folded styles. Each card will have the diners’ details and their food choices included, making it easy to see whose cards go where, and who is eating what. You can also add images like the company logo if you wish. They can then be printed directly from a browser or a PDF, or downloaded to CSV for easy viewing. Extra information like the company the diner is associated with, and any guest comments are included. You’ve probably noticed we recently re-launched our www.resdiary.com booking portal to be better optimised for search engines and user experience. 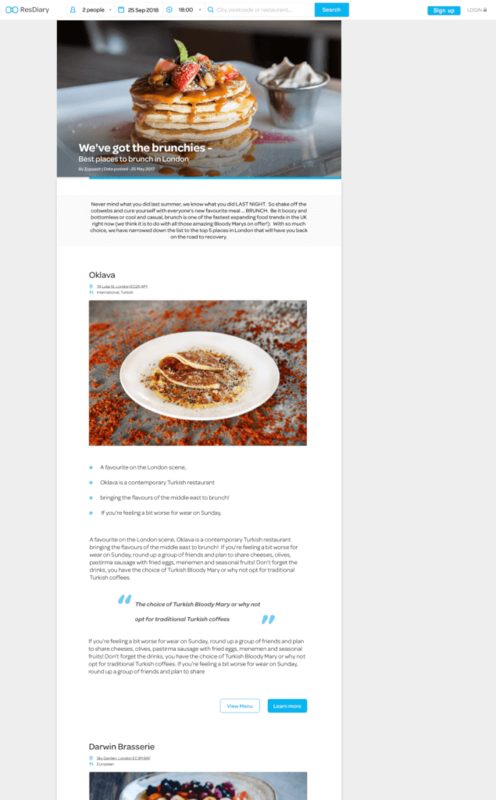 Now, we’re launching an integrated blog featuring loads of great content about ResDiary restaurants. It’ll help diners who are looking for inspiration, and drive more bookings to your venues. If you want to be featured, get in touch here. Finding restaurants on www.resdiary.com just became even easier for diners with our new search features. Customers can now type the cuisine they’re looking for into a search bar, rather than scrolling through a list (do chipolatas count as a “cuisine-type”?) and they’ll be told how far away venues are from their current location. We’ve also added in the number of restaurants that are available to book that meet their search criteria. Our Cookies Policy has been updated to ensure it is in-keeping with GDPR policy. Not something huge, but a change to keep everything ticking along nicely. Who needs Christmas presents when our development team just keep giving?